Passengers wait in Suvarnabhumi airport’s departure hall. The Airports of Thailand (AoT) board on Wednesday (23 August 2017) awarded a 14.2-billion-baht contract to PCS Joint Venture to carry out a key part of Suvarnabhumi airport’s upgrade. The Thai-Chinese consortium, comprising Power Line Engineering Plc and China Construction Engineering Thailand Co, beat out two other bidders vying to build the first midfield concourse building (levels 2-4) and the connection to the southern tunnel (sub-structural works). PCS Joint Venture’s quote was 12% below AoT’s reference price and lower than those of Italian-Thai Development Plc and UQSY Consortium, which consists of Unique Engineering & Construction Plc and Ssangyong Engineering and Construction of South Korea. The contract is one of several major deals awarded by AoT for work related to the long-delayed expansion of Thailand’s overcrowded gateway airport. 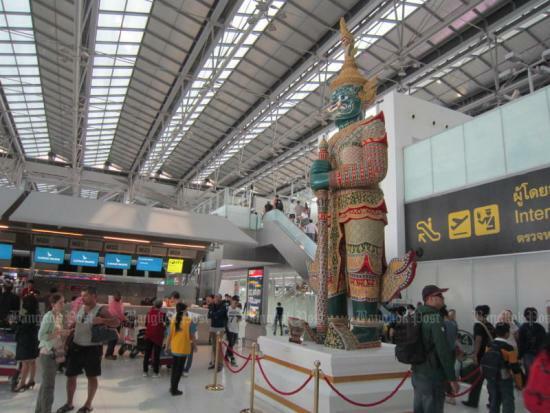 Phase 2 development is geared towards raising Suvarnabhumi’s annual passenger handling capacity to 60 million in 2019 from 45 million now, at a total cost of 53.3 billion baht. A year ago, AoT granted a 12.1-billion-baht contract to Italian-Thai Development to build levels B2, B1 and G of the first midfield concourse building and a connection to the southern tunnel for structural work and the main system. PCS Joint Venture will handle additional work for those structures. Key features of the Suvarnabhumi expansion include the construction of a four-storey mid-field terminal with 216,000 square metres of space, installing an automated people mover system, extending the existing passenger terminal from its eastern wing to provide 60,000 sq m of extra space, bolstering supporting infrastructure and building a new airline office building. Meanwhile, AoT’s board yesterday agreed to extend a 10-year concession to King Power Suvarnabhumi Co to operate commercial activities at Terminal 1 of Don Mueang airport. The firm, a unit of King Power’s duty-free conglomerate, beat out three contenders — The Mall Group, Minor Food Group Plc and Central Department Store — for the concession.